The mix of doom metal and death metal has arguably been around in some form since some time in the 80's and has since been perfected by notable and influential bands like Asphyx and Autopsy. 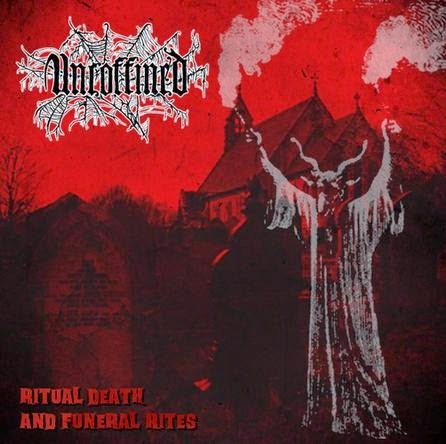 The Finnish scene especially is known for it's gloomy ways in death metal, and much in the same way we find the British band Uncoffined, who've subscribed to the old ways of down-doomed metal of death. 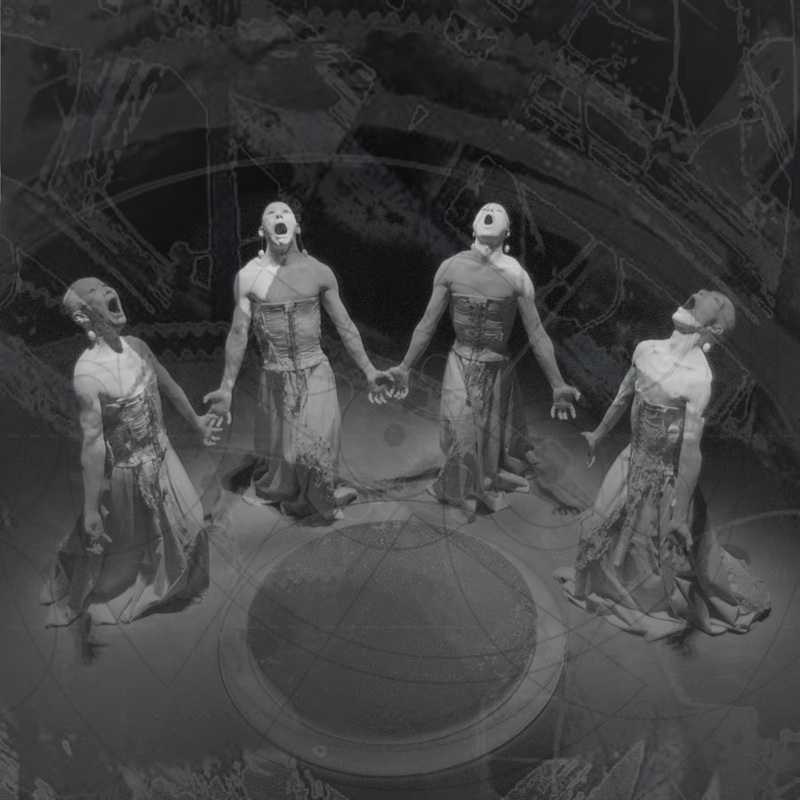 Spanish label Memento Mori heeded their growling calls and released their debut album "Ritual Death and Funeral Rites" in the autumn of 2013. Treated to a few classic quotes from the British school of horror flicks, we're sent on a journey through heavily distorted and down-tuned guitar melodies and roaring, cavernous vocals. The whole thing is set at a murderously slow pace, showing no signs of ever halting its forward momentum. The churning chugs mixed in with a few darkly melancholic melodies are adequately accentuated by a powerful bass. One can only guess whether the immensely simple yet compelling songwriting is the result of one man's effort or the orchestrated endeavor of the entire band, but the musicianship in itself speaks of a band seasoned in the arts of metal. Indeed, all the members of the heavy quartet have play in several bands of varying nature - Something that is highly evident on Ritual Death and Funeral Rites. Were I to compare the accomplisment of Uncoffined to a more established act, it would be Finland's shooting stars Hooded Menace. However, this is also where the British band's shortcomings are revealed. Hooded Menace are a result of the international death/doom scene booming in these last few years, probably reaching its all time high in popularity. And by that standard, Uncoffined have joined the movement in the eleventh hour, almost completely missing the boat. Were it not for the great craftsmanship with which their material is presented, they would by now already feel very dated, like a band seeking to cash in on a trend. What Ritual Death and Funeral Rites really lacks are more tempo changes. The distorted convulsions of guitar are of the essence in this manner, but without even slower or some faster passages to emphasize their meaning and effect it's hard to fully appreciate the crushing broadsides of sluggish overdrive and fuzz in the long run, which in this case of just above forty minutes of murky horror-worship. 7/10 guitars. Once Switzerland was a place where legends formed, with Hellhammer - and subsequently Celtic Frost and Triptykon - being the reigning kings of metal there. Recently the country of Switzerland has begun stirring anew with the miasmic sounds of Bölzer resounding through proverbial catacombs. But enough talk of Switzerland's exports of metal - Everybody knows, or at the very least should know of, bands like Samael and Coroner. Let us instead deal with the Swiss underground, Forsaken Legion in particular. 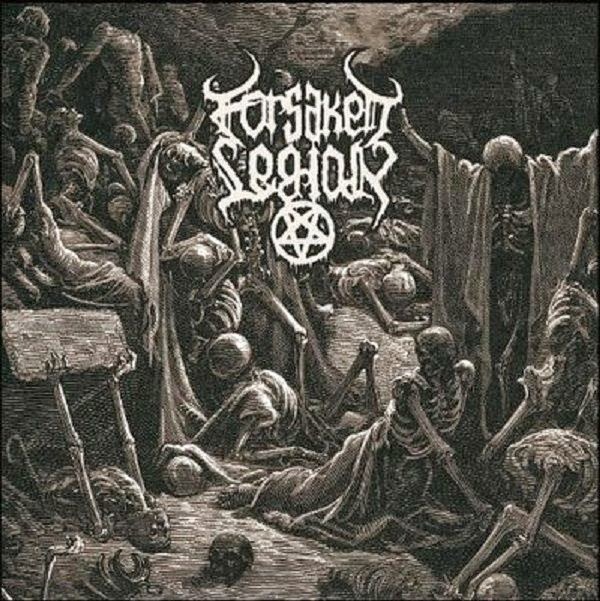 Forsaken Legion formed in 2012 and released their first album in december that same year. Though their sites and profiles are tagged as black metal, there's a bit more to it than that. Tracks like Crow has a definite thrashy edge, while something like Human Decay - like you may have guessed - has a strong death metal influence. These variations lend great strength to the music found on Seeds of Black Dawn. Forsaken Legion refuse to conform to the standard practices of the genre, and while they may not be wholeheartedly legend-material their debut album makes promises of great things yet to come. There's no use shoehorning the quintet into genre conventions. It's not that there is anything new and exciting about the way they mix extreme metal genres, but they are entirely their own, doing exactly what they please. The songs are built on a strong foundation of blackened metal, empowered by thrashing riffs, blast beats and death-like growls, a few creeping melodies lurking in the background. While the drums are executed at profound speeds and with a fair bit of force, they could be utilized better to underline the powerful rhythm section. The title track stands out as the best use of tempo changes and the "classic" black metal sound, bringing to mind bands like Dark Funeral and Marduk. All in all, though, without a more tight rhythm section and more attention to flow of songwriting, Seeds of Black Dawn falls through as a modern classic. It should be enjoyable to most fans of blasting black metal mixed up with a bit of the ol' death n' thrash combo, but apart from a few well-made compositions the album holds little merrit as anything but background noise. 6/10 guitars. Turmoil breeds frustration and anger, which in turn breeds outlets for that frustration. South America has had a rich history dating back to the early 80s of metal bands expressing their anger through their music and lyrics, and like those legendary and trendsetting bands from the days of yore, the four-man group Asilo from Argentina presents a lyrical universe revolving around themes such as politics and the suffering it can bring, set to a soundtrack of furious and often dangerously calm mix of doom-laden drones drenched in grimey sludge. Pure aggression is one of the mainstays of Asilo's music, of that there can be no doubt. In a hardcoresque style, lead singer Manuel Platino practically screams his lungs out to the sounds of harshly distorted bass and thunderous percussion. Comunión's structure as an album is also one of the strengths that underline the band's style. The way it fluctuates between insane cacophonies and inky pools of fragile pianos - or even saxophone at one point - is what makes listening to Comunión as an album interesting. However, aggression necessitates some kind of structure and form. Were it not for the disciplined interludes of classical piano set regularly throughout the album to provide some sort of contrast, Comunión would appear to be a harsh collection of discord. There are a multitude of examples of bands that do this unhinged, rambling musical lunacy all too well, but Asilo lack the intensity and groove that those bands utilize. The vocals, though wholy authentic and honest, come off as a bit too immusical to me. In grindcore, the gratingly raw vocals are an essential part of the whole expression, complete with that intense wall of distortion. But in Asilo, the vocals take up a lot of space in the mix, and needlessly so. Coupled with that is a lifeless overall sound which so lacks that concentrated emission of sound. This isn't the first time I've had the (dis)pleasure of listening to guitarless music, using instead a fairly driven bass. But to be succesful in that endeavour, you better make damn sure the bass has drive and punch enough to take the guitar's place. The main highpoint of Comunión was, to me, Miedo y Curiosidad from the latter part of the album. This track feels somewhat out of place, although not entirely. It features the same harshness as the rest of the album, but is graciously garnished with the haunting sounds of a well-played saxophone, adding a thick atmosphere of eerieness that the rest of the album sorely needs. Elaborating on what I mentioned earlier, Asilo's first actual album since their spawning in 2010 is an honest affair where they stay true to their own values - Something that many bands could learn a thing or two from. But that particular style does nothing to me, other than fill me with a wish of listening to something else. The saxophone melodies in Miedo y Curiosidad committed that last shred of reason to the insanity that made it a more easily digestible portion, but the rest of the album remains a bothersome clutter of confusion. 4/10 guitars.